Jeffrey Marshall Foxworthy, commonly known as Jeff Foxworthy, is a famous American actor, radio and television personality, film and television producer, stand-up comedian, as well as a voice actor. To the public, Jeff Foxworthy is perhaps best known as a part of a comedy group known as “The Blue Collar Comedy Tour”, which consisted of such comedians as Ron White, Bill Engvall and Larry the Cable Guy. The troupe was first formed in 2000, when Jeff Foxworthy had already established himself as a well-known comedian and actor. Known for his television series called “The Jeff Foxworthy Show”, Foxworthy started touring together with several of his friends, in such a way giving birth to “The Blue Collar Comedy Tour”. The group toured for six years until 2006 and in that period released three stand-up comedy films, including a critical and commercial success under the name of “The Blue Collar Tour: The Movie”, as well as several CDs and DVDs of their performances. Prior to working with the troupe, Jeff Foxworthy went on to release his own comedy albums, two of which, namely “You Might Be a Redneck If….” and “Games Rednecks Play”, have been certified Platinum three times. The first album topped the Billboard charts, while the latter sold more than two million copies around the world. In addition to performing stand-up comedy, Jeff Foxworthy tried his luck on television screens and made appearances in “Are You Smarter than a 5th Grader?”, hosted “The American Baking Competition” and “The American Bible Challenge”, as well as voiced characters in “The Fox and the Hound 2” alongside Reba McEntire and Patrick Swayze, “The Smurfs” with Neil Patrick Harris, Tim Gunn and Hank Azaria, and “The Smurfs 2”. A famous comedian and an actor, how rich is Jeff Foxworthy? According to sources, Jeff Foxworthy’s net worth is estimated to be $100 million. Needless to say, most of Jeff Foxworthy’s wealth and net worth comes from his involvement in the entertainment industry. Jeff Foxworthy was born in 1958, in Atlanta, Georgia, where he initially studied at Hapeville High School, and later enrolled in Georgia Tech. However, Foxworthy did not graduate from Georgia Tech but instead went on to work for IBM. While still working for IBM, he took part in the Great Southeastern Laugh-off competition, which was his first step in the direction of becoming a stand-up comedian. Several years later after his performance at the “Punchline” comedy club located in Atlanta, Jeff Foxworthy won a “Best Stand-up Comic” award and went on to release several comedy albums. Around the same time, Foxworthy launched his own television series entitled “The Jeff Foxworthy Show”, which was on air for two seasons. 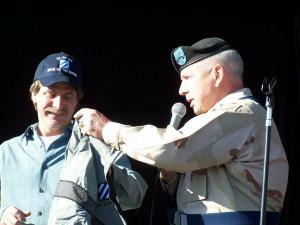 Wishing to return to stand-up comedy, Foxworthy created “The Blue Collar Comedy Tour”, with whom he not only performed live, but also released several albums, as well as a popular television series called “Blue Collar TV”, which featured guest appearances from Drew Carey, Jeff Dunham, Brad Pitt, The Warren Brothers, and Ronny Cox among many others. 3 Does a 1-2-3 finger gesture or salute at the end of "Are You Smarter Then a Fifth Grader? ", possibly for his wife and two daughters. 2 (in 2006) I turned down a movie this summer because it was nine weeks in Vancouver and my oldest daughter is 14. I've got four more summers with her. I'm not giving away nine weeks of her summer to go do a silly movie. 4 If you break into my house, I *will* shoot you. My wife will shoot you and then spend thirty minutes telling you *why* she shot you. 1 Jeff's interior designer Barbara Dobbs was married to his good friend and fellow-comedian Ron White. 11 He lives next door to his brother in Atlanta. 12 On The Jeff Foxworthy Show (1995), he had two sons, acted by Haley Joel Osment and Jonathan Lipnicki. In reality, he actually just has two daughters. In fact, there are no sons on his side of the family. He, his brother and sister are parents to daughters only. 13 In 2007, Forbes Magazine estimated his earnings for the year to be $10 million. 14 Jeff Foxworthy and actor and filmmaker Eric Bruno Borgman are cousins. 16 He is a member of (and perhaps unofficial leader of) the Blue Collar Comedy group that also includes his friends Bill Engvall, Larry the Cable Guy and Ron White. 17 Graduated from the Georgia Institute of Technology (Georgia Tech) in 1979. 18 Graduated from Hapeville High School in Atlanta. 19 In early 1998, Jeff opened the first of a new restaurant chain called Jeff Foxworthy's Backyard Bar-B-Q in Kissimmee Florida. He says his restaurant business flopped. 20 Father of two daughters. Jordan was born in 1992 and Juliane was born in 1994. 2001 Grammy Grammy Awards Best Spoken Comedy Album For the album "Big Funny". 1999 Grammy Grammy Awards Best Spoken Comedy Album For the album "Totally Committed". 1996 Grammy Grammy Awards Best Spoken Comedy Album For the album "Games Rednecks Play".